The Breadboard Piano plays tones as you move a wire between sockets on your breadboard. When you close one of five circuits, Arduino plays one of five different tones. By moving the wire between sockets, you choose which tone to play. An Arduino. We use the Arduino Uno, but any standard Arduino is appropriate for this project. A piezo speaker. Any simple speaker will do; we use a piezo speaker because it is inexpensive and it suits our needs. A 1000 ohm resistor. Although we use a 1000 ohm resistor, you should feel free experiment with different values to see how it affects the result. You may also need a different value for your resistor if you use a speaker other than the one we suggested using. *  Create a very simple "breadboard" piano using a jumper wire to simulate pressing each "piano" key. *  This one has 5 notes, but you can expand it using more digital IO pins. // scan "piano keys" for one that is "pressed"
delay(100);    // probably not needed.. you can experiment! Create a new tab: Click the little triangle just under the Serial Monitor button on the right side of the window and select New Tab. Name that new tab pitches.h. Upload the project to your Arduino. Move the black wire between the multicolored wires to play different tones. Use buttons instead of moving a wire around. Hook up LEDs that correspond to each note being played. 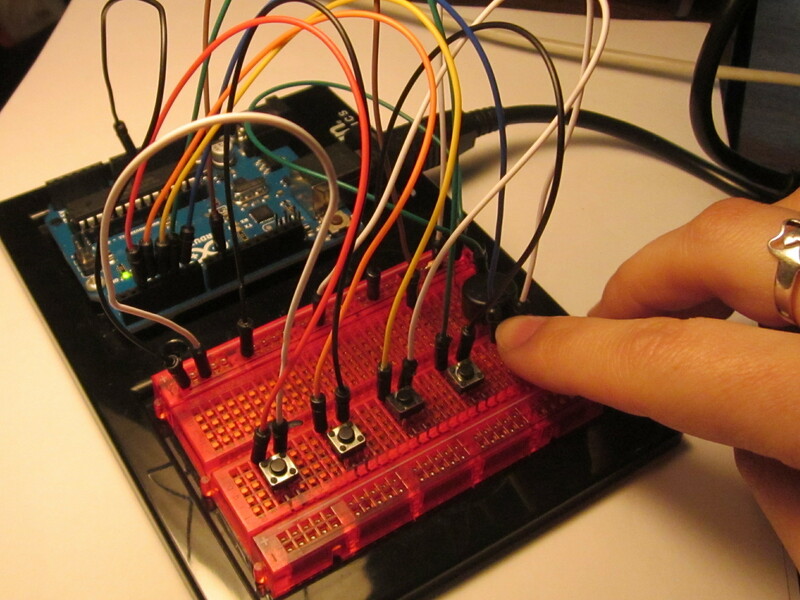 Figure out how to make the Arduino “remember” what you play and then play it back.